Venue: Manchester Arena. Date: Saturday, 27 February. Time: Ringwalk expected at 22:45 GMT. Coverage: Listen to live commentary on BBC Radio 5 live and follow live text updates on the BBC Sport website and app. If you have seen the film Kes, you'll better understand the decision of Scott Quigg's parents: Billy Casper had his hawk, Quigg had his boxing. Both were desperate to escape the tyranny of school. But while Casper's dream was crushed, Quigg's dream flew. When Quigg was 15, he asked his headmaster to expel him. Quigg wasn't a bad kid, he just wasn't interested. Unlike Casper's family in Kes, Ken Loach's bleak study of suffocated hope, Quigg's family noticed his real passion. And so his headmaster opened the cage and let Quigg go. "It took a lot of courage and my mum and dad got a lot of stick," says Quigg, who fights Carl Frampton for the unified super-bantamweight world title in Manchester on Saturday. "'Who would advise their kid to drop out of school with no qualifications?' But it was the best thing that ever happened to me. "I wasn't getting anything out of school and the school wasn't getting anything out of having me there. My mum and dad knew what I loved to do and we came to the conclusion that the more time I practised, the better I was going to be." As part of the deal, Quigg was meant to enrol in college. But he never turned up. Having been offloaded by Burnley FC for being too small, Quigg's permanent seat of learning became the gym. No girls, no beer, just wall-to-wall boxing. Unless he was sweeping the floor in a factory, the sobering long-term alternative. "I didn't want to work in a factory," says the 27-year-old from Bury, who excelled at Thai boxing as a kid before learning to rely solely on his fists. "Mum and dad used to say 'make something of yourself, don't waste what you've got'. "They always grafted. Dad made windows and at one point Mum was doing the milk round in the morning, two parcel rounds during the day and working in my nan's chippy at night. "And that's why I'm here now. The dedication, the focus has all come from their example and decision to back me." Even at 15, Quigg's dedication was simultaneously frightening and comical. "We went to Florida one Christmas," recalls Quigg's dad Kenny. "While the rest of us were going round the theme parks, he was getting up at 6am, shadow boxing in a weighted vest in the garage. No Mickey Mouse, that's for sure." If Quigg had bumped into Mickey Mouse, he probably would have chinned him. Kenny and wife Lyndsay are still living with their son's intensity to this day, under the same roof. Feeding the beast before making their escape. "He's always had that desire to win," says Kenny. "You could see it in his eyes. But if anything, he's got even worse. I've never seen anything like it. "He's on another planet. Living with him is quite strange to be honest with you. Even when he's not fighting, everyone's creeping about. Even the dogs keep quiet. "He hasn't lived a life for the last 10 years. He's like a monk. I'm thinking he needs to get out, go and play the one-armed bandits at the fair or something. But he's not interested in anything but winning." Lyndsay is often up before her son, at 5am. When Quigg returns from swimming, breakfast is ready. "I'm always on the end of the phone," says Lyndsay. "He'll ring me up in the pub and ask me to put his veg on. "I time him on the track sometimes or go down the unit and hold the pads for him. I feel like I'm in a training camp, the same as Scott. Everything just revolves around what he's doing and I worry just as much as him." Team Quigg, which also includes sister Daisy and girlfriend Beverley, is a well-oiled machine. In a brief amateur career, Quigg won a junior ABA title and boxed for England. He turned pro in 2007 and won the British super-bantamweight title in 2011, having recently joined forces with Bolton-based trainer Joe Gallagher. In 2013, Quigg was made the WBA 'regular' champion, a title he defended on six occasions. But all the while talented Cuban Guillermo Rigondeaux was the WBA's premier titlist, Quigg was easy to dismiss as a paper champion. When Frampton beat Spain's Kiko Martinez to win the IBF belt in 2014, a unification match between the British rivals seemed inevitable. Both men claimed they wanted it, but this was boxing. It was another 14 months before the fight was set, by which time the odds on Quigg winning had shortened. Exhibit one was Quigg's two-round demolition of Martinez, who took Frampton the distance. Exhibit two was Frampton's below-par performance against the unheralded Alejandro Gonzalez, in which the Belfast fighter was knocked down twice in the first round. 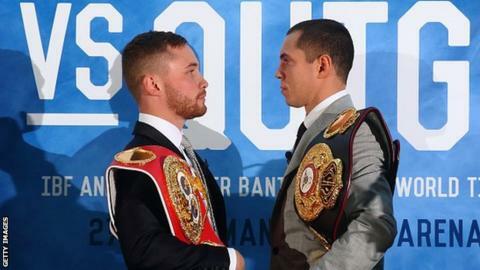 Suddenly, Frampton's superior attitude seemed misplaced and Quigg has been winning the PR battle ever since. "I rate Carl very highly," says Quigg, who was upgraded by the WBA again last November when Rigondeaux was stripped for inactivity. "But he has many flaws and I believe 100% that I am the better fighter. "Not only do I have the better skills, but nobody lives like I do. People say they're dedicated and focused, but they don't come close to the way I live." Quigg's story raises questions about education, passion and parenthood. If Billy Casper had had a family like Quigg's behind him, instead of his hawk ending up in a dustbin, he might have been the greatest falconer who ever lived. Bit late for a spoiler alert. Unless you're Carl Frampton. Watch a full interview with Scott Quigg on this week's Saturday Sportsday at 12:50 GMT on BBC One on 27 February.